The Honeymoon Cabin was once the most popular destination in Green Timbers before it was removed in 2016 despite the protests of backpackers, hikers and snowshoers. The cabin was perched on a high ridge above the Sturgeon River Valley where on a clear evening the sunsets can be stunning. The old cabin may be gone but the location is still an unusual spot to spend the night or even a leisurely lunch before heading back. The Honeymoon Cabin was once the most popular destination in Green Timbers before it was removed in 2016 despite the protests of backpackers, hikers and snowshoers. The cabin was perched on a high ridge above the Sturgeon River Valley where on a clear evening the sunsets can be stunning. The old cabin may be gone but the location is still an unusual spot to spend the night or even a leisurely lunch before heading back. If planning to overnight, carry in a tent and water. There is no source of drinking water at the site where Honeymoon Cabin once stood. Carry in what you need or be prepared for a steep descent down the ridge to the Sturgeon River. Most people hike in from Sturgeon Valley Road, a trek of 3.8 miles. An alternative route is from Bush Road, an easier hike of roughly a mile and both routes are described below. In the winter you’re limited to starting from Sturgeon Valley Road, which is plowed by the county. The Green Timbers trailhead along Sturgeon Valley Road is marked by stonegate entrance and a locked yellow gate that prevents motorized users from entering Green Timbers. The trail is an old two-track that for the most part is straight forward and easy to follow. It heads north along through the forested valley along the Sturgeon River though you rarely see the river itself in the beginning. You're enclosed by ridges to the west, however, that rise almost 100 feet above the trail. At Mile 2, the trail reaches a "T" junction. To the west is Club Stream and the marked boundary for Fontinalis Club, a private hunting and fishing club. 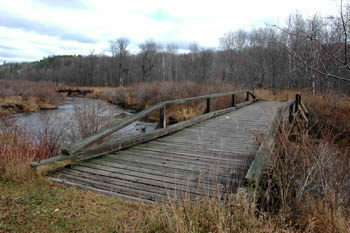 Head east and in a quarter mile you’ll descend to a wide bridge across the Sturgeon River. On the other side, at Mile 2.3, is the site of the old Green Timbers Cabin, a one-room log structure that was removed in 2016. 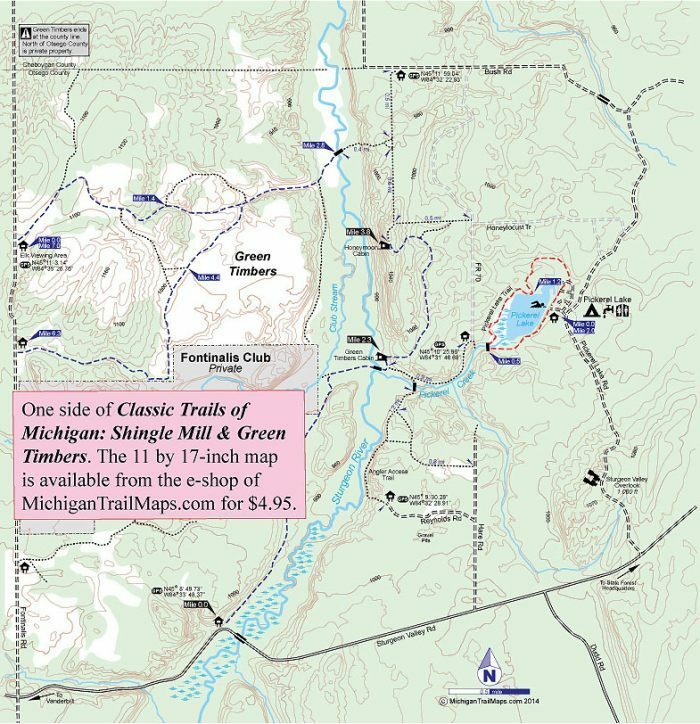 From the cabin site, one trail skirts Pickerel Creek and another immediately begins climbing into the nearby hills to the northeast as a two-track. Look for the trail that heads into the hills and follow it. You actually break out on the backside of a ridge, in something of a narrow valley, so protected from those murderous winter winds that deer have packed the snow with dozens of bedding area. In the valley, you hike north for 0.75 mile to a “V” junction. The spur to the northeast is a faint trail that leads to a parking area on Honeylocust Trail. To the west is a trail that begins climbing a 1,050-foot ridge. The ridge is steep and the quarter mile to the crest with a full pack on is no picnic. But at the top or 1.5 miles after crossing the Sturgeon River, is where Honeymoon Cabin once stood. 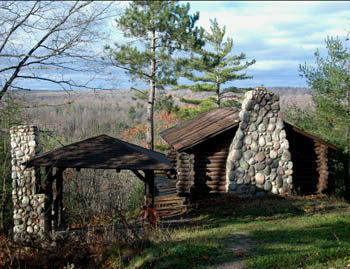 This classic log shelter had a large stone fireplace on the back wall while the front of the cabin was a deck perched over the edge of the ridge, a slope drops suddenly for more than 100 feet. The view from this spot is still one of the most stunning panoramas in the Lower Peninsula that includes the Sturgeon River Valley. The most challenging part of this route from the north to where Honeymoon Cabin once stood is just getting to the trailhead on Bush Road. If it has been raining hard, think twice about driving the forest roads that lead to Bush Road unless you have four-wheel drive. From the small parking area, an old two-track heads due south and is marked in the beginning by an earthen beam to prevent motorized vehicles from entering Green Timbers. The trail is very easy to follow as it follows the rolling crest of the ridge forming the east side of the Sturgeon River Valley. The terrain here is hilly and heavily wooded. At Mile 0.5 you reach a junction with a trail heading west right) that is not nearly as distinguishable as the two-track you’re on. This trail sharply descends the ridge to the floor of the valley and within 0.4 mile reaches a bridge over the Sturgeon River. The two-track continues south and at Mile 1 is a junction with a well define two-track that extends east (left) to a parking area on Honeylocust Trail. A couple hundreds further south and you arrive at the scenic site of Honeymoon Cabin before it was removed in 2016. Other than trailhead parking areas, there are no facilities in Green Timbers. That includes campgrounds or even vault toilets or sources of safe drinking water.